After years of delays and a billion-euro price tag, Jerusalem's light rail system, which has stirred controversy across the Holy City, is gearing up for its long-awaited launch in the first half of next year. Construction work has backed up traffic in already car-choked Jerusalem for years, leaving locals and shopkeepers frustrated and fed-up. ‘The population has suffered since the work began in 2006, but we’ve achieved our goal,’ said Shmuel Elgrably, spokesman for the Jerusalem Transport Management Team, a group of experts advising the transport ministry and the city's mayor. The project was supposed to be finished in 2008, but the completion date has repeatedly been pushed back for a variety of reasons, ranging from construction errors to the unexpected discovery of historical artefacts. It has also come under political attack because the completed network will run through mostly Arab east Jerusalem, which was occupied by Israel during the 1967 Middle East war. A pro-Palestinian group is suing Alstom and Veolia, the two French companies involved in the project, arguing that they are violating international law by allowing the network to run through occupied east Jerusalem. ‘This has earned us boycott threats and lost us important contracts,’ a Veolia official told AFP on condition of anonymity. The Palestinians oppose any extension of Israeli control over the eastern part of the city. On the ground, residents and shopkeepers along the tram's route complain of having suffered years of loud, dirty construction work. ‘We had to live with the dust, we were assaulted by jackhammering, and as a result our customers abandoned us,’ grumbled one merchant in the city centre. While acknowledging the difficulties that the building work has caused, Elgrably said there was no alternative. ‘It had to happen. The city is going to have more than a million people within 15 years,’ up from 790,000 today, he said. Israel's government is relying on the new tram system to cut the number of cars in the centre of the city, increasing pedestrian access and reducing pollution. During the bidding in 2004, it offered a 30-year concession which was won by City Pass, a consortium comprising Israeli civil engineering firm Ashtrom, along with France's Alstom and Veolia, backed by funding from Israel's Harel Insurance and Polar Investments. The initial line will include 24 stations strung along a 14km route. It will travel from Pisgat Zeev, a Jewish settlement neighbourhood in east Jerusalem, to Mount Herzl in the west, passing along Jaffa Street, the Holy City's central shopping artery. The projected figures are based on a report showing some 37.7% of people living along the tram's route use public transport. In total, some 46 carriages, each able to carry 250 passengers, will be put into service. During peak hours, a train should arrive every five minutes. Eventually, the network is to be extended to the Hebrew University in the east of the city and Hadassah hospital in the west. 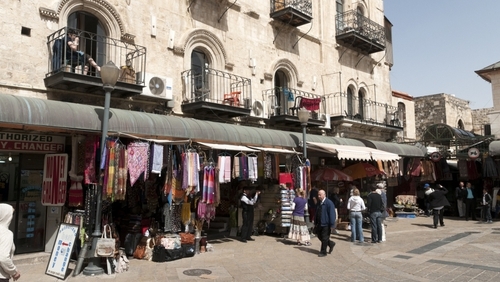 The project has run up against a number of logistical challenges, some of them common to any city planning project and others more unique to Jerusalem's peculiarities. Some 300 families were evicted and compensated to make way for the rails, and numerous topographical problems had to be worked out. The project also required the formation of a special anti-terror unit, and the renovation of roads dating back to the Ottoman period. One final challenge involved finding a way for the tram to turn at a right angle at the western end of Jaffa Street. A tunnel was proposed, but in the end the city decided on a bridge, and commissioned Spanish architect Santiago Calatrava to design the project. The result? A striking suspension bridge with ‘strings’ to resemble the harp said to have been played by the Biblical King David.